Organ donation is often a hard conversation to have. An open discussion is difficult since the topic is about death but remind yourself it is also about life. When the unthinkable happens we do not have time to think about donating organs since we are dealing with grief and a variety of emotions. We all need to open the discussion and I hope I can show you why. Did you know that organ donation can save 8 lives and further saves up to 80 lives now with tissues, valves and other vital organs in the human body. I have seen and continue to see people and children whose lives have been saved by this wonderful gift. I currently personally know ten children in our province who have had transplants and are doing amazing things with their lives. My daughter had also been a recipient of donor tissues and she continues to thrive. We are very thankful that she is no longer in immediate need of a donor heart but we however know that this will be necessary in the future. Each year thousands of Ontarians get a second chance to live life to its fullest, thanks to the kindness of people who have given the ultimate gift but sadly everyday on average 18 people die waiting for that second chance. Some people still believe that you can be too old to donate but this is not the case. There is no age-related reason not to donate. We as compassionate human beings can plan to give a gift of life and we can start by opening a discussion with our family and friends. This is also very important since in Ontario even if you have registered at beadonor.ca your family can decide not to donate your organs. Canada continues to have one of the lowest donation rates so let’s change this! Let’s talk so we all know and then we can respect each others wishes. I am now going to include one of my favourite stories written by the late Robert Noel Test. Read this to your loved ones to open up this discussion – it is so very important – Let’s Talk and remember loss can equal hope. At a certain moment a doctor will determine that my brain has ceased to function and that, for all intents and purposes, my life has stopped. When that happens, do not attempt to instill artificial life into my body by the use of a machine. And don’t call this my “deathbed.” Call it my “bed of life,” and let my body be taken from it to help others lead fuller lives. Give my sight to a man who has never seen a sunrise, a baby’s face or love in the eyes of a woman. Give my blood to the teenager who has been pulled from the wreckage of his car, so that he might live to see his grandchildren play. Give my kidneys to one who depends on a machine to exist from week to week. Explore every corner of my brain. Take my cells, if necessary, and let them grow so that someday a speechless boy will shout at the crack of a bat and a deaf girl will hear the sound of rain against her windows. If you must bury something, let it be my faults, my weaknesses and all my prejudice against my fellow man. Give my sins to the devil. Give my soul to God. If, by chance, you wish to remember me, do it with a kind deed or word to someone who needs you. If you do all I have asked, I will live forever. Today I want to tackle a subject that has haunted me for many years. When my daughter was born with HLHS, we were given three options, a heart transplant, three open heart surgeries or to do nothing and let her die, also called compassionate care. We chose the surgical repair and never did I ever think of the last option until years later when I was once again haunted by these words. Our journey continued with HLHS and many years after her successful repair I took her to an Oakville hospital to meet her new cousin who was just born. Once in the hospital one of the nurses came up and knew about my daughter had a heart defect and asked which one. I told her she had Hypoplastic Left Heart Syndrome and her eyes looked very perplexed. She then said to me that a baby was born here also who had the same condition. I asked her why the baby was born here and she pointed to one incubator on the other side of the room and stated that the family did not want to pursue any medical interventions for their child. At that moment I sat silently and stared at that incubator in the back of the room. I couldn’t understand why no one was holding that baby and then understood why that baby did not cry. This beautiful gift would never see the sunshine, would never play on a slide or ever have the chance to survive. I guess I never thought about this option but if chosen I now know that families can choose to leave their baby at the hospital for their last moments. I remember leaving and getting lost on the way home. My mind never stopped wondering who that child was of could have been. I do not want to open a discussion or argument on this subject but these are my true feelings and it still haunts me as to why. Many years later one of the teachers at our local school told me someone she knew was expecting a child like Colena. She asked if I would mind speaking with them and I eagerly said yes. I never heard anything for a couple of days until she told me that they decided to terminate the pregnancy since they did not feel that they could financially handle it. Walking home I once again wondered why two children who I never knew came into my world with this situation and why the choices were made. Current statistic say that HLHS occurs in 3% of life births and I met two families, what are the chances of this. I once again want all readers to know that I am not here to judge these parents and I am not trying to open a discussion on choices, I only want to express how I felt knowing these private matters. I will openly admit that I do not feel that doctors should even offer compassionate care as an option. I have always felt very strongly about this. In the past the odds of HLHS children surviving with either option were very poor, but that is not the case now. They do however go through extreme pain and a cautious future but everyday the medical world is finding new answers so they must be given the chance. One thing I certainly know is that my life has been enriched by not only my daughter but by the doctors, nurses and all the staff that worked so hard to keep my angel with me. These special children are gifts for all people who surround them. Rage on Heart Warrior! At Sick Kids Hospital and other childrens hospitals there is a program called Bravery Beads. This program gives beautifully coloured beads to children facing life challenging illnesses after each procedure that they endure. Beads in history have signified wealth, strength and courage the two later descriptions are something our heart kids have known all too well. 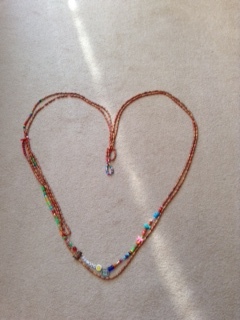 My daughter was diagnosed with HLHS shortly after birth and has a necklace with over 500 beads. This necklace is beautiful but is a stark reminder of all the pain and tears that my daughter experienced. I am so very proud that she is a warrior and a survivor but I am also sad and bewildered that she had to endure so much pain. This program is wonderful but at the same time I wish it never had to exist. No child should have to endure pain when their life is just starting. Only our Heart Community understands first hand how much pain our kids experience since our kids rarely show any outward signs of sickness, only faded scars. Paul of Tarsus once quoted, ”Let us run with perseverance the race marked out for us”. This is what our kids do everyday and they continue to amaze us. As advocates for our kids we must continue to spread the word. As a parent I am forever grateful for the care and expertise given to my child at Sick Kids Hospital. I am also thankful for Cardiac Kids since they are giving our families a voice to show how important Congenital Heart Defects are. My daughter is strong, compassionate and thankfully a fierce fighter. This honourable chain hangs on her bedroom door and every night it is a constant reminder of how far she has come. I have however tied the ends with double knots in hopes that she will not string anymore on. Rage on Heart Warriors! Jean Johnson is a regular blogger for Cardiac Kids. Read her bio and learn more about Colena’s story here. Be sure to check back next week for Laurie’s first post!